Industry 4.0 and digital twins are buzzwords we hear on a daily basis. But how far have companies come, and how does COMSOL come into play in the new era? Here, we will look into one successful case, where ABB Traction Motors intends to make mass customization available by using simulation applications for electric motor design. By turning high-fidelity multiphysics models into simulation applications, new analysis capabilities are planned to be available to several departments, from product design to sales. The use of electric motors is becoming more prominent, and according to The International Energy Agency (IEA), they represent roughly 45% of the global power consumption. Small changes in the design of the motor can lead to enormous energy savings, in addition to improved performance and durability. ABB has produced electric motors for more than 100 years, and we can only imagine how many different motor designs have been introduced throughout the company’s long history. As with all things, there is room to continue to improve the design, and experts at ABB have been using simulation tools as a part of the product development cycle for many years. 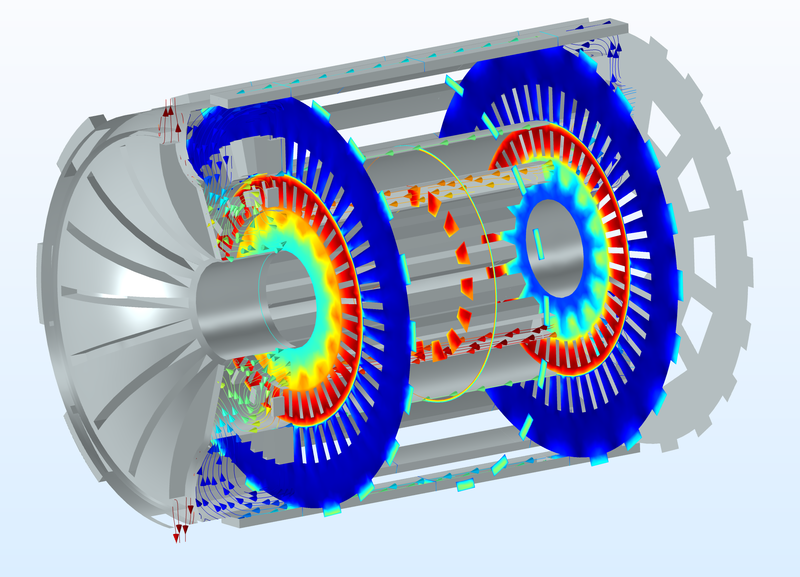 Simulation applications for heat transfer and CFD analysis of self-ventilated electric motors. The applications are built with the COMSOL Multiphysics® software and deployed with COMSOL Server™. The applications are run in a web browser, while the computations are performed on a server at ABB. A traction motor is an electric motor used for the propulsion of a vehicle, such as a train. Different vehicle types require different conditions, and each motor is tailored to meet the individual customer specifications. Factors such as location, number of starts/stops, and the time it will run between each stop (known as the duty cycle) are taken into account for the design. ABB Traction Motors provides power and automation technology for customers ranging from railway to e-mobility. To maintain a competitive edge, they strive to reduce product development cycles by digitalizing their workflow. To provide their customers with superior products, they must execute the lowest energy consumption while building on the motor’s reliability. 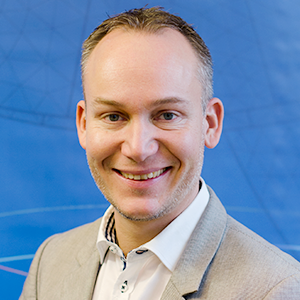 To succeed in delivering this promise, using simulation tools throughout the entire design process has been vital. ABB Traction Motors initiated a new project, called NG Design Tool, to create an easy-to-use software tool that could predict the temperature in a traction motor during different operation conditions and duty cycles. The project was led by Dr. Shafigh Nategh, R&D senior engineer and project leader at ABB Traction Motors. Experts and students from Politecnico di Torino in Italy, Chalmers University of Technology, and The Royal Institute of Technology in Sweden were invited to tackle this challenge together. Traction motors use different cooling systems, as described in Ref. 1: They can be liquid-cooled and air-cooled. The air-cooled motors can be open, closed, or semiclosed types. When a fan is mounted on the shaft of the motor, this is known as self-ventilation. The other option is to use an external fan. In order to predict the temperature correctly for both the cases, a CFD simulation is required to understand the airflow in the different parts of the motor. CFD simulations can be time consuming, especially when the time scales have a big difference. In the case of a traction motor, the rotational speed is varied from zero to around 6000 RPM, with duty cycles that can last for hours. In short, the time scales range from milliseconds to hours. In order to solve a model of this caliber, which involves rotating parts with a sliding mesh and turbulent flow, the team at ABB Traction Motors had to find a way to reduce the simulation time while maintaining accuracy. In the beginning of the project, they set high goals, requiring the level of accuracy in the CFD models compared to measured data to exceed 95%. It was shown that the numerical simulation exceeded the accuracy goal in roughly 30 minutes on a standard PC. By using the frozen rotor approach included in the CFD Module, the team at ABB Traction Motors was able to save hours of computation time. To get a complete picture of the cooling behavior at the different speeds in the motor, they found that simulating the stationary behavior of the air at some specific rotational speeds was sufficient to describe the cooling behavior of all rotational speeds. The need for time-consuming simulations with transient, turbulent fluid flow with sliding mesh was removed. The finite element mesh that is used to simulate the fluid flow inside a self-ventilated motor. The airflow velocity inside a motor at a constant rotational speed of 2500 RPM. The airflow velocities from the CFD simulation were then exported to a heat transfer simulation. The airflow in the different parts of the motor were transformed to appropriate heat transfer coefficients that vary with rotational speed and other conditions, as described in Ref. 2. Using the built-in functionality for equation-based modeling in COMSOL Multiphysics, this step was relatively easy to implement. Since the heat transfer model has less degrees of freedom compared to the CFD model and it uses symmetry conditions, it solves very fast — even for transient duty cycles. When the R&D team was satisfied with the models and the results, they started the next phase of the project: to transform their know-how into simulation applications. The Application Builder, available in COMSOL Multiphysics, enabled the R&D team to package their knowledge into custom simulation applications based on the needs of the end user. This provides the possibility for other departments, from product design to sales, to test different configurations for their particular requirements and pick the best solution before physical prototyping. 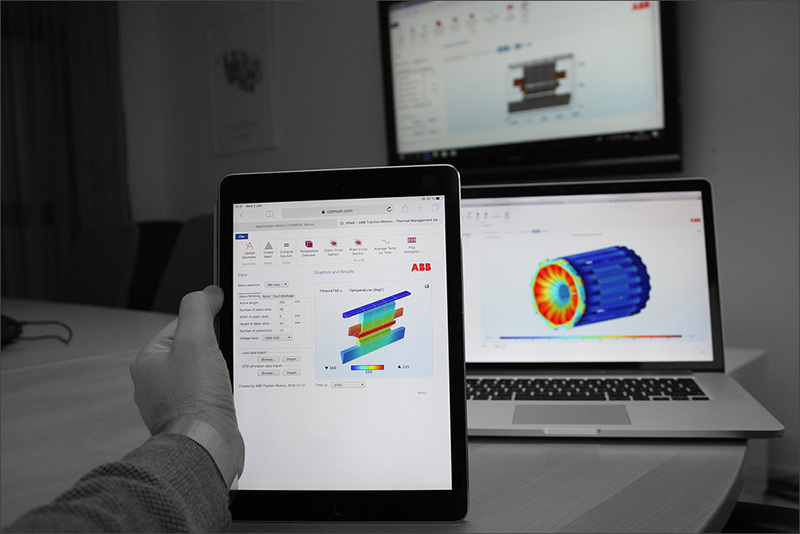 The simulation applications were uploaded at ABB using COMSOL Server™. With COMSOL Server™, the applications are immediately available to anyone in the world with a user account on the internal ABB network and access to the specific applications. The R&D team has control over who is granted access, as COMSOL Server™ includes tools to manage user accounts, user groups, and privileges. Therefore, the only requirements to run the applications are a valid COMSOL Server™ user account at ABB and a web browser. The computations are run on a cluster node that is connected to COMSOL Server™. With this setup, the R&D team at ABB Traction Motors provides the possibility for application users to access the same powerful simulation technology that is found in COMSOL Multiphysics. 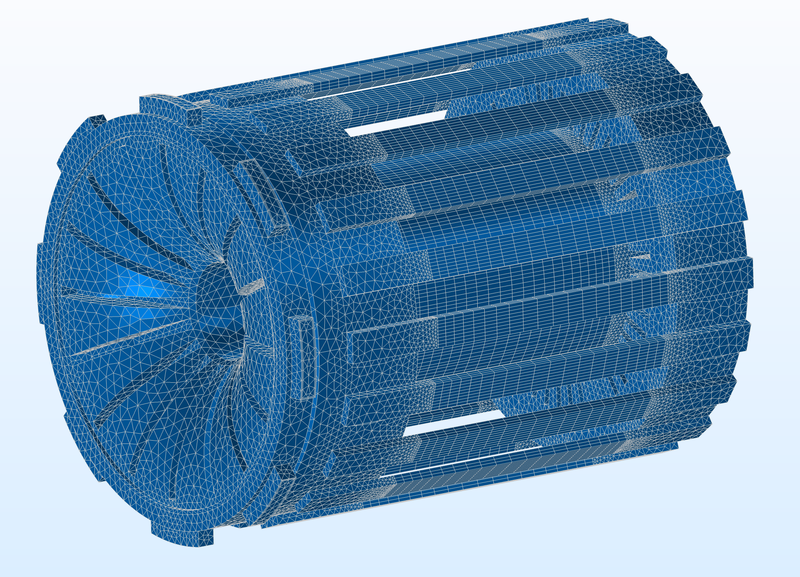 The end users of the applications can be experts in traction motors without becoming experts in numerical simulation. S. Nategh et al., “Review and Trends in Traction Motor Design: Electromagnetic and Cooling System Layouts”, XIII International Conference on Electrical Machines, 2018. S. Nategh et al., “Transient Thermal Modeling and Analysis of Railway Traction Motors“, IEEE Transactions on Industrial Electronics, vol. 66, no. 1, pp. 79–89, 2019.